The Schools always keep to their pedagogical role and ensure that their students develop a wider knowledge of their educational and professional choices. At the same time they provide students with mental abilities, values and principles that will guarantee their happiness and lead them to success. Entrepreneurship Programs are career orientation programs based on the principles of experiential learning where participants learn through observation and interaction with executives of an organization or a company. The programs last four weeks and are divided into two phases. In the first phase, students are introduced to the basic principles of operation of a company while in the second phase they acquire experiential experience on its premises on a daily basis, participating in meetings and dialogues with executives and thus familiarizing themselves with the subject. Understand the value of the proper choice of studies and training to claim the profession they want. Get into contact with a wealth of professional choices and prospects. Be aware of the need for ongoing training so that they can keep track of the constantly evolving expertise. Develop into people who will be satisfied with their job in the future. Students are informed by specialists (university professors, prominent professionals) about modern and traditional professions, discuss undergraduate and postgraduate programs, visit workplaces in collaboration with the STEAMulator educational program, which is organized by Creative Vision Lab, and thus they get professionally oriented and can choose their future jobs with knowledge and responsibility. The Virtual Business education program of JA (Junior Achievement) Greece gives young people the initiative to find a business idea, do research and set up their own student business, thus developing creativity, teamwork, critical thinking and entrepreneurial skills that will lead them to suitable study and career choices. 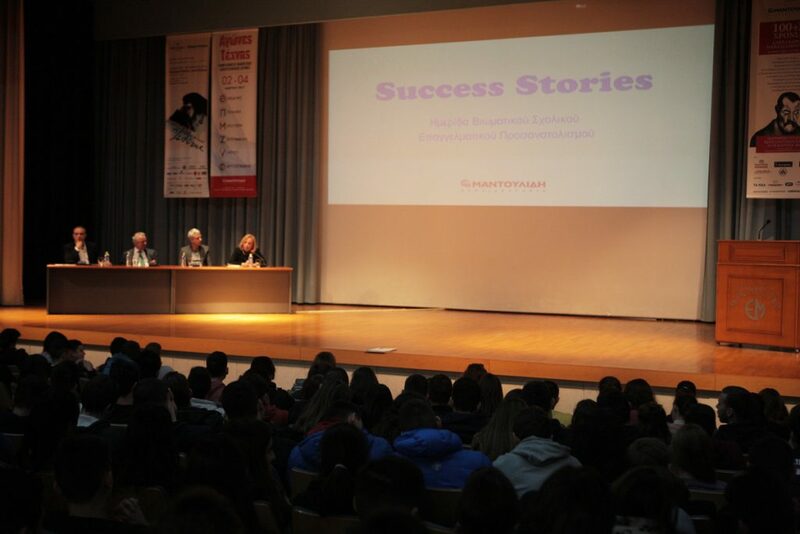 Students of 9th - 11th Grade had a unique opportunity to be informed on the prospects of the new landscape in work, the connection of the labor market with knowledge and the requirements of their educational and professional future at the Experiential Vocational Guidance Meeting entitled “Success Stories”. 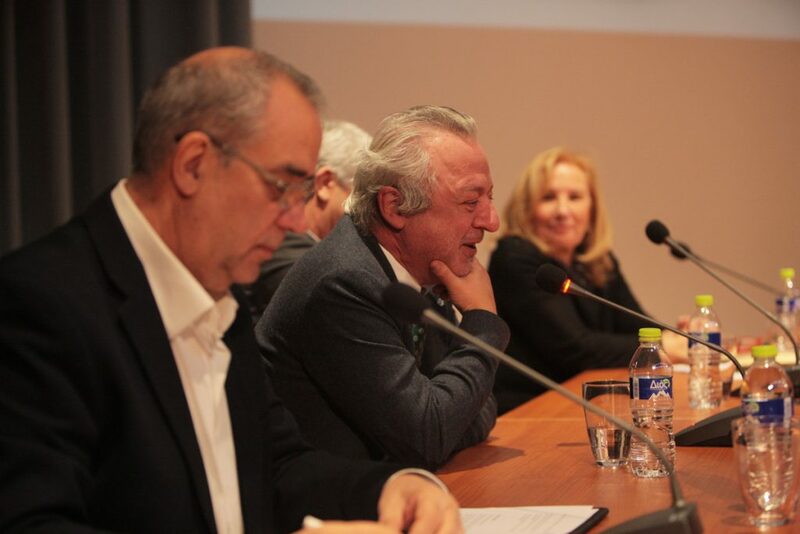 Personal approaches to scientific and business recognition and views on the modern university, enterprises and their relations were shared by Fani Athanasiadou, Professor Emeritus of the Faculty of Medicine of A.U.Th, Director of the Department of Pediatrics at Interbalkan Medical Center, Vangelis Gerovasiliou, Winemaker, Founder of the Gerovasiliou Estate and Panagiotis Kouvrakis, Founding Member of BETA CAE Systems. The common conviction of all the speakers was that love must be the main criterion for choosing your future profession. The students should pursue their professional future in keeping with the dreams and needs of their soul. During the event, the students asked questions and expressed their own views on the thorny issue of vocational guidance. 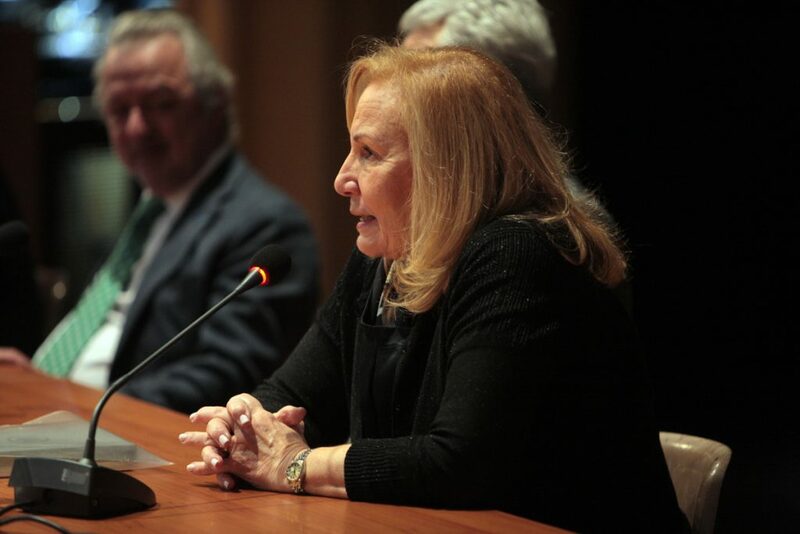 Mrs. Ekaterini Mantoulidou, President of the Schools, referred to the vision and professionalism of the Schools’ founder, Evangelos Mantoulidis, while General Director, Mrs. Aspa Hasioti expanded on the Experiential Vocational Guidance Programs implemented at Mandoulides Schools. 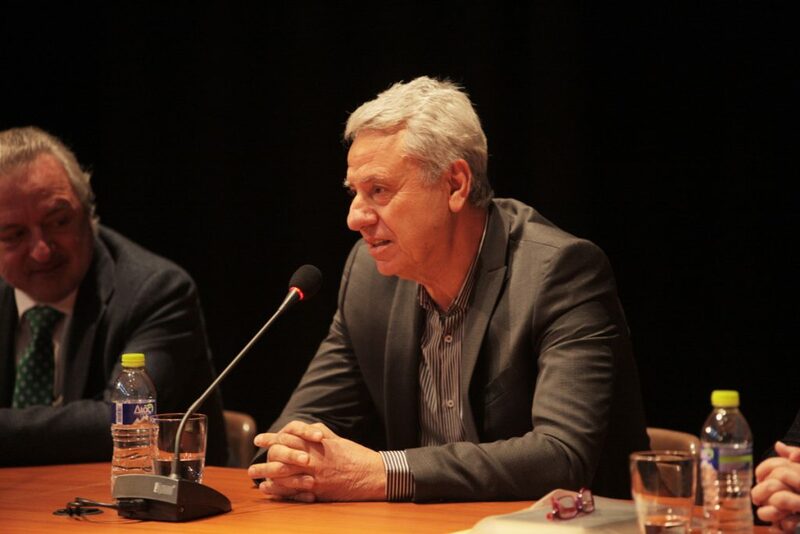 The discussion was coordinated by Mr. Kostas Bliatkas, Journalist, Writer. As part of the program, special experts and associates of the Schools will discuss with parents issues relating to the development of children and adolescents, including the effective management of inappropriate behavior; relationships and communication within the family; sensitive issues such as self-esteem and contending with difficult behaviors; as well as anxiety, socialization, and empowerment of children and adolescents by teaching them values that will contribute to their smooth integration into society and the world. Parents Seminars will take place on Wednesdays at 18:00 - 20:00, on the Junior - Senior High School premises (Building B). Parents will be accommodated on a first come first served basis, and are able to choose the topic that interests them depending on the program. Experts examine students on the Schools grounds or in their office and send parents written information on the results of the examination. The Schools, in their efforts to support the difficult and challenging but also exciting parenting task, organize workshops, seminars, and parent meetings, every year. Within these informative events and meetings experts analyze issues, answer questions and constructively discuss issues concerning the development of children and adolescents; the effective management of inappropriate behavior; relationships and communication within the family; and particularly issues such as self-esteem, socialization, learning difficulties and the empowerment of children and adolescents. Considering that the needs and concerns of each student are unique, the Schools support the psychologist cooperation program with students and their parents. With the association "Action to Bring about Change"
With the nursing home "Myrtia"
With the association "Open Arms"
Students of our Schools pay weekly visits to the pediatric oncology departments and entertain the young patients. They play board games with them, sing, and engage in creative activities. Students of our Schools pay weekly visits to the creative workshops of the Action to Bring about Change association and encounter persons with disabilities. Young volunteers take part in the association with the help and support of all members, so as to gradually assume specialized roles. Students of our Schools pay weekly visits to the “Myrtia" nursing home and assist the residents through discussions, entertainment and games. The Lilliputian artists of Mandoulides Kindergarten create art work that is put on sale to benefit the Smile of the Child social welfare organization. Students and graduates of our Schools participate in the half marathon Night Run for Hope and Health, organized in the center of Thessaloniki. This activity provides students of the Elementary School a first acquaintance with the concepts of volunteerism and solidarity. Through various activities, the program seeks to develop collaboration and social contribution. Peer tutoring performed by outstanding Senior High School students to Junior High School students always under the supervision of their respective teachers. Participation in the half marathon Night Run for Hope and Health supports the efforts of "Amymoni" (Hellenic Association of Parents and Friends of People with Visual Impairment and Additional Disabilities). The Schools’ Christmas Charity Bazaar displays creations and products of the member of this association. Students and graduates of Schools participate in activities and theatrical performances of "En Dynami" (group of children with special abilities). During the Christmas Charity Bazaar a display space is available where creations and products from the group are sold. Students of the Schools participate in actions and initiatives of “Open Arms” (Friends of Social Medicine and Pediatrics - Thessaloniki Branch). During the Schools’ annual Christmas Charity Bazaar a display space is available where creations and products of the members of this association can be purchased. Faithful to genuine sportsmanship and actively applying the values of volunteerism and solidarity, teams from the Elementary School and the Soccer Academy participate in the sports tournament organized annually by the Smile of the Child social welfare organization. Young students of the Day Care Center, Kindergarten, and English Garden, join forces with the Lara Guide-Dog School to contribute to the invaluable work of the school that its people provide with great love and in a scientific approach. As part of the innovative program "Animals Offer Their Eyes", children are sensitized and at the same time informed about these unique guide dogs who offer their eyes to our fellow citizens with total or partial loss of vision. Every year, with the participation of thousands of students, parents, teachers, and friends of the Schools, the Christmas Charity Bazaar titled "Triangle Wishes, Treats, Love and Kisses" is organized by the Schools and MAS Mandoulides, in a festive atmosphere and with the intention to offer to our fellow man. The proceeds of the charity bazaar strengthens groups, associations and individuals who have financial or social problems. Mandoulides Schools, regarding blood donation as an invaluable contribution to society and knowing that demand for blood is constantly growing, have founded a blood bank, where faculty and staff as well as students’ parents and guardians may donate blood voluntarily. Love is the beginning, the middle and the completion of the display of our humanity, and, as a result, the only God-given gift. The Schools’ voluntary blood drive is tangible proof of this love. Voluntary blood donation is the most important indication of real humanity. The willingness to offer without expecting a reward is an innate human characteristic, indicative of people with moral values and emotions. In these hard times, let us not treat each other with indifference. Let us show our love and light up the faces of our fellow man.